Are Bank Products Simple, Fair, and Transparent? - The Kafafian Group, Inc.
Home > Insights > Jeff For Banks > Are Bank Products Simple, Fair, and Transparent? I have never heard a bank customer say, “gee, I wish my bank relationship was more complex.” Yet we charge business checking fees based on a complex analysis, offer a 7-month special CD only to roll it into a lower yielding 6-monther if the customer isn’t attentive, and require high-interest checking customers to have 10 debit transactions, e-statements, and a partridge in a pear tree to get that rate. Sound simpler, fairer, and more transparent? Is The Government Your Friend? On the other side of the coin, bank customers don’t necessarily understand what it takes to run their accounts profitably. Dear customer, the Federal government requires financial institutions to monitor your account for suspicious activity and report anything untoward. That costs time and resources that drive up the cost for your checking account. That is why every overdraft fee, interchange transaction, and minimum balance fee counts. Your government drives up bank costs. It costs $423 per year for a bank to run a retail interest-bearing checking account, based on my firm’s product profitability database. To cover that cost solely on the spread that your balances generate would require an average balance of $21,363 in your account. All. The. Time. I have written on these pages that I thought the past practices of relying on customers to be asleep at the switch and accept rates significantly different than market rates will soon be over. Banks must shift business models to pay depositors something closer to market rates for “accumulation accounts”, which are accounts for long-term savings such as an emergency money market account, or a CD ladder. Cost of funds advantages should be built on having relatively higher “store of value” accounts such as checking, or special purpose savings where convenience and safety are more important to the customer than accumulation. So I don’t point out a problem without proposing a solution, I have an idea for a Simpler, Fairer, and more Transparent small business banking deposit product. Call it the Jeff For Banks (JFB) Business Banker Account. As I mentioned in past posts, I’m a narcissist and I’m trying to get something named after me. 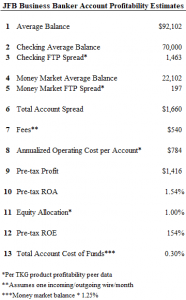 The product is a combined store of value checking account, and an accumulation money market and/or sweep account. But no sweep here into a repo where we have to pledge investment securities against balances. That wouldn’t meet the simple test. Banks can pay businesses interest on their checking accounts. So I propose banks segment business checking accounts by their resource utilization, and create minimum balances based on this segmentation. So the college bar that drops off bags of money each morning at the local branch has a higher threshold before it doesn’t get charged a monthly maintenance fee and receives interest. So the average balance for high utilization quartile account might be $70,000, above which the account receives a competitive interest rate, and below which the account is charged a monthly maintenance fee. Here is what the math might look like for Pete’s Corner Bar. The bank would still charge per use fees for things like wires, ACH’s, overdrafts. And receive interchange income. But the spread should cover items presented plus profit for the bank. Imagine having 10,000 of the JFB’s Business Banker Account. Instead of 1,000 of this account, 2,000 of that account, 4,000 of another account, and 3,000 old grandfathered accounts. Which would be easier for your branch and business bankers to explain to your customers? And marketing people tell me that bankers sell what they know. Does the JFB Business Banker account pass the Simple, Fair, and Transparent test?